Spent a lovely afternoon in the East End yesterday – had a great meeting with the AD of Atrium Theatreand we’re going to work together on a couple of things. Then I trundled off with my friend Colette toPentimento Gallery to see what John had up on the walls. Never disappointed. 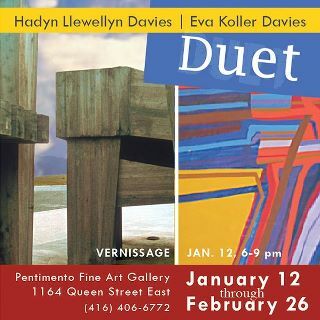 John was delighted to see us and talk to us about the current exhibition, Duet – sculpture by Haydn Llewellyn Davies and paintings by Eva Koller Davies. He won. He’s done something marvelous with the money. All the pieces in the gallery are obviously model sizes of these giant works – there’s a beautiful feeling the tension in them – like they’re all being held together by a breath. You can see Japanese influence, you can see Stonehenge influences.What do I like most about him? That he resigned as senior vice-president and director of McCann-Erickson Advertising in 1976 at the age of 55 to become a full-time sculptor. To leave at the top of your game because you`ve succeeded and on to the next thing is truly admirable. To me, anyway. I always stand with my hands clasped behind my back in sculpture galleries – something about them makes we want to touch them, the feel the smoothness of a curve, or the sharpness of an edge, to get the sense of heft of something. John asked why i was standing that way and I explained – and he said I could touch the art. Happy me. It adds another dimension of experience to the work. 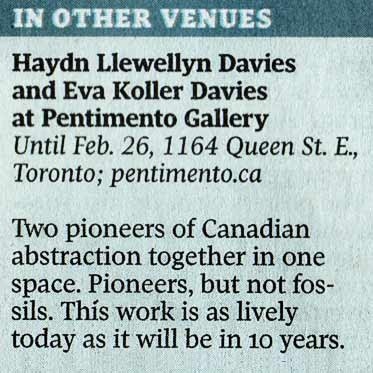 Plus when we go visit during the week, John is usually alone in the gallery and so he has time to talk, really talk about the work, and the artist behind it – things that make them a human being (fun fact – Haydn and Eva met when they were children, selected to attend very special art classes at OCAD. At the time of his death, they`d been married 60 years.) We`re lucky to have that opportunity to essentiall yhave a personalized tour of a gallery and its work. It`s always a treat to visit John and Pentimento. I learn something every time I go, whether it`s about the current show, the last show or a showdown on the set of something. Lovely day indeed.